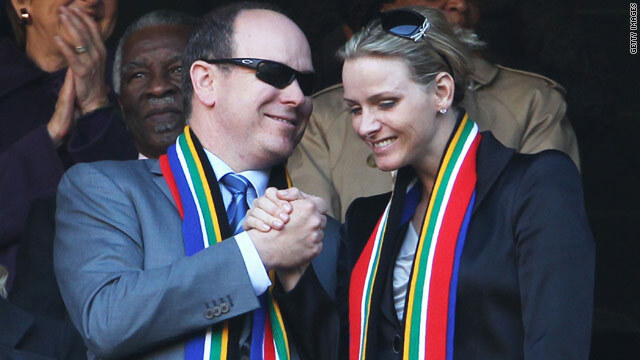 Prince Albert II of Monaco and Charlene Wittsock at the World Cup match between South Africa and Mexico on June 11, 2010. (CNN) -- Prince Albert of Monaco is engaged to former South African Olympic swimmer Charlene Wittstock, the palace announced Wednesday. The 52-year-old prince and ruler of Monaco, the first child of Princess Grace and the late Prince Rainier, has never married. In a 2004 interview with CNN's Larry King, Albert admitted it had taken him "longer than most" to find a wife. "There have been some relationships where, had they gone on a little bit more, they would have headed that way," Albert said. "But I think it's -- it's so much your own timing and your own agenda and the person you want to be with." Like his fiancee, Albert is also an Olympian, having competed in five Olympic Winter Games -- from Calgary in 1988 to Salt Lake City in 2002 -- in bobsledding. He is a member of the International Olympic Committee and president of Monaco's national Olympic committee. Albert has two younger sisters, Princesses Caroline and Stephanie. The prince and Wittstock have been photographed together many times in the past four years, leading to speculation they would eventually marry. Albert has two children from previous relationships -- a 6-year-old son born to Nicole Coste, a flight attendant from Togo, and an 18-year-old daughter born to American Tamara Rotolo, a former waitress. Neither child is in line for the throne under Monaco law, which says succession passes only to direct legitimate descendants. Albert was formally invested as Monaco's ruler following the death of his father in 2005. Monaco, a sovereign principality, is one of the smallest countries in the world, measuring just under two square miles. It sits on the French Riviera and is bordered on three sides by France, with a population of about 33,000 people.